Ladies-Only Murder Mystery – Killer Apprehended! Another murder mystery was concluded on Friday, August 8th, 2014. The ladies-only investigation began at 6:30 and ended three hours later with the arrest of the murderer. Justice prevails once again! It was the quarterly meeting of the Gazillionaire Girls Group, an exclusive club whose membership is comprised of successful women who made it big without relying upon the other gender. The hostess for this unique gathering was entertainment guru Bertha Brothert. Her upscale line of products appeals to the nouveau riche. Brothert’s yacht, ‘The Perfection’ was the scene of the meeting. A special guest was present to entertain the Group’s members and to predict their futures. Famed fortuneteller Madame Magda pulled out her crystal ball and told the assembled clique of distinguished daughters of destiny that many good things await them. Suddenly, a shocked expression crossed the mystic’s face as she shuddered in horror. The crystal ball, she proclaimed, was emphatic in predicting that someone would soon die. The next morning, true to her words, a body was found floating nearby the yacht. It was Madame Magda herself who was the victim! A large group of distinguished and well-dressed women arrived to assist in the murder investigation. With ten suspects and five other characters to question, they had their work cut out for them. But first, to fortify the ladies for their daunting task, they first dined on Cordon Bleu, bacon wrapped green beans, salad, and for dessert, peaches and blueberry crisp. After dinner, interrogations began in earnest. Everyone tried their best to extract the most information from each suspect, hoping for a slip-up that might reveal the killer. Additional information was provided by the Crime Lab and the Coroner. After intense questioning, each of the suspects was considered. Motive, Means and Opportunity were examined. Some suspects were identified as very likely to have committed the murder. Others were eliminated by their alibis, or being ‘too obvious’ a suspect. At last, the murderer was revealed, handcuffed and presented with a ‘Bad Kitty’ scented soap. The investigators also voted on the Best Dressed Lady of the evening, and she was presented with a gaudy bauble, a genuine diamondoid of over 200 carats. Melanie and Perry thoroughly enjoyed hosting this special ladies-only murder mystery. 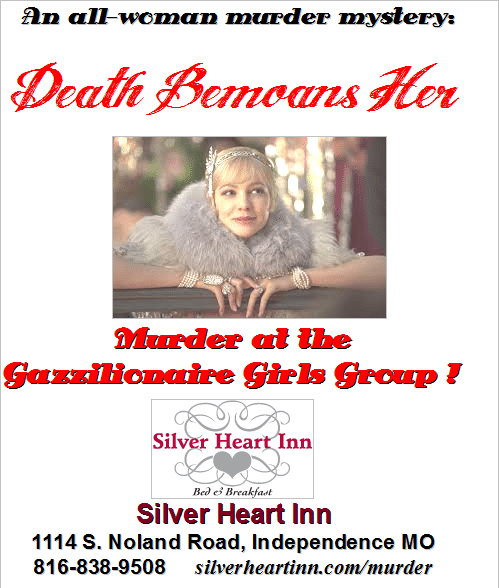 Watch this page for details on future Murder Mysteries at Silver Heart Inn. You can conveniently purchase tickets online, or by phone.  If you’ve never been to one of our Murder Mysteries, here’s what to expect.